Askmebazaar is back with another great offer, Now Get Big Bazaar Gift Voucher worth Rs.3,000 at flat Rs.2880 only + Pay via Mobikwik wallet to get additional 15% Cashback into your wallet (Effective Price just Rs.2630 only). Grab this offer discount deal now before it gets out of stocks. 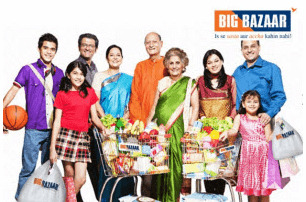 Big Bazaar is India’s largest hypermarket that guarantees more value for your money. Gift your loved ones the freedom to choose their own gift with Big Bazaar Gift Voucher. The gift voucher allows them to shop from the wide range of products offered at all Big Bazaar, Food Bazaar and FBB stores across India. Proceed further and add / update your delivery address (If Required). Wait for the arrival of your Physical Gift Card. Start Shopping, make your Cart and proceed to checkout. This Gift Voucher has to be redeemed in full and partial redemption is not allowed. This Gift Voucher is not redeemable for cash or credit nor can be exchanged for a gift voucher/gift card. If the Customer misplaces the gift voucher, the company shall not be responsible to reimburse/refund. Validity period of this Gift Voucher will not be extended under any circumstances.